We had a great weekend, so much so, that I will write about it as opposed to a rainy Monday... what is up with all this rain, and more coming our way! Saturday afternoon I made a quick trip to Jessica knits after taking my pictures of my secret pal package... I needed to buy Monkey fur-- ok, Monkey yarn for my next project. Saturday afternoon I took some much deserved time to re-watch one my new favorite movies from Netflix-- Lost in Translation. 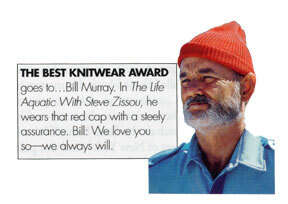 I love that movie-- even more so, I love Bill Murray. I loved him in SNL - I loved him in CaddyShack- and his character in Lost in Translation is very cool, he is an awesome actor. My fave scene- Karaoke lounge with Bill singing Roxy Music's "More Than This." I just bought the best of Roxy Music-- I totally recommend this CD-- sample it on amazon.com. Who else could pull off that knit hat!?! I would knit Bill a hat anyday!- But for now I will work on ribby who is about 1/2 done, yes Ribby has taken on her own personality... I am still thinking of a name for her. This came across my email(re: if women ruled) basket a few days ago from my friend Anny-- I must admit, I have been obsessed with this, and I actually think with the right marketing... this would be a hit! 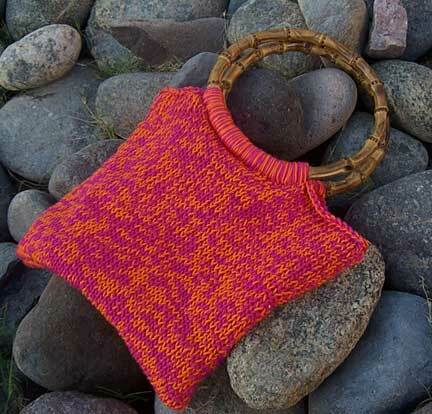 This bag was knitted based off the SnB pattern, but because of the Noro shortage, I used two strand of Tahki Cotton Classic. Again, my signature orange and pink colors shine thru!